Auction Closed. Sold via Buy Now $800. Next Auction Monday May 1. 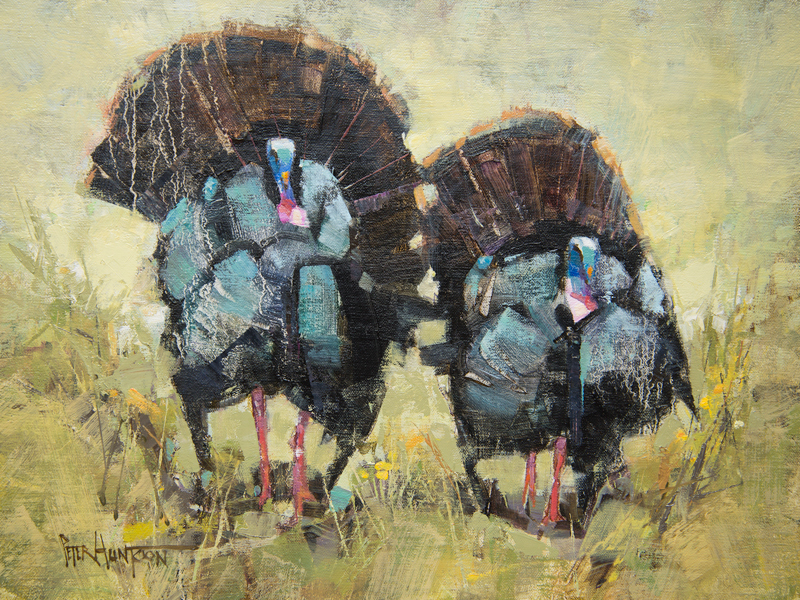 The hills are alive with the sound….of Gobblers! 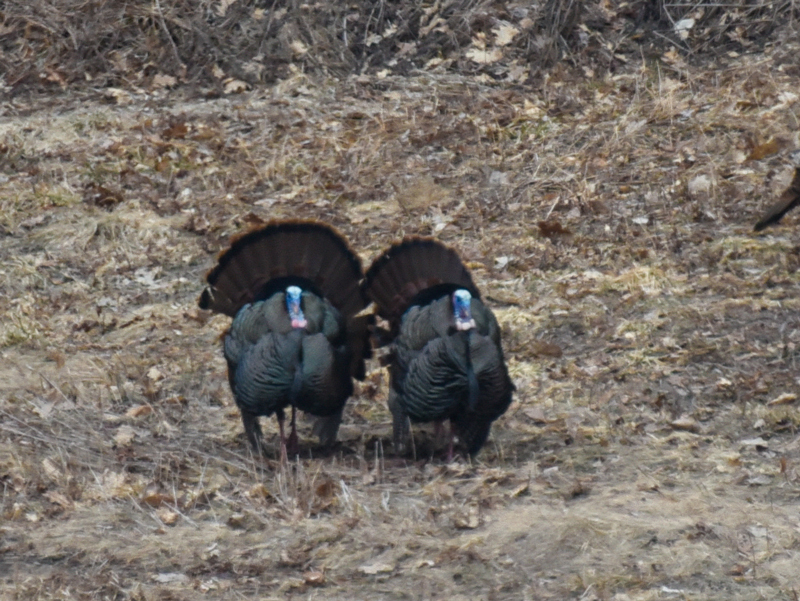 These big boys were feeling their oats and strutting their stuff on a recent spring morning. I’m sure all the local ladies were duly impressed. Back when I first heard about the birds and the bees, I sure wasn’t thinking of turkeys. Please Note: This auction will run two weeks while I explore a bit. See you again on May 8th! Great painting! 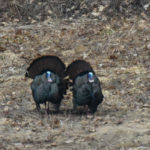 Most people don’t realize turkey heads are blue. Love it! Love it…can really see and feel them strutting their stuff! Nicely done, and very timely. The largest tom I’ve ever seen ambled out of the neighbor’s woods and across our back yard last week. Two enthralled females followed in his majestic wake. He stopped to slowly open and close his tail feathers a couple times, turning in all directions. A real performance! “Majestic wake”… might have to borrow that one some day. Thanks Steve! Such a pretty picture! Thank you Peter! We see lots of them around here and they certainly do strut their stuff! Love them! 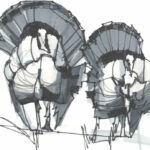 I just love the turkeys! We have 3 Toms at the horse rescue. They are quite the characters and always getting into the cats’ food bowls. A real trio of beggars. 🙂 Thank you always for your amazing talent. I love your paintings, Peter. My favorite so far is the one with the sap buckets hanging from the trees that you posted a couple of weeks ago. These illustrations remind me so much of my childhood in Morrisville and West Glover. Vermont is truly a magical place!! I lived there from 1965 until I graduated from Lake Region in 1971 and joined the Army. My family lived there until 1992, so I went back to visit often. I surely miss Vermont! Glad I can help stir your good memories Brad! These turkeys are fantastic. Just love how you got their character. Even more than about turkeys, to me, this painting is all about light and how it affects everything we see. From a very young age I was fascinated at how even a black crow could flash with varied colors and sometimes a jewel-like brilliance depending on how the sun’s rays hit it. As you have depicted in this beautiful abstract painting, a turkey is indeed a colorful bird, especially under sunny skies. “The Pair of Kings” is really great…. Love your style. I love The Pair of Kings! Yes, I felt quite fortunate to get this photo reference. I have a long telephoto lens and needed it for this one. Thanks Cynthia! I love this! I see a flock of turkeys several times per week on my way to work. 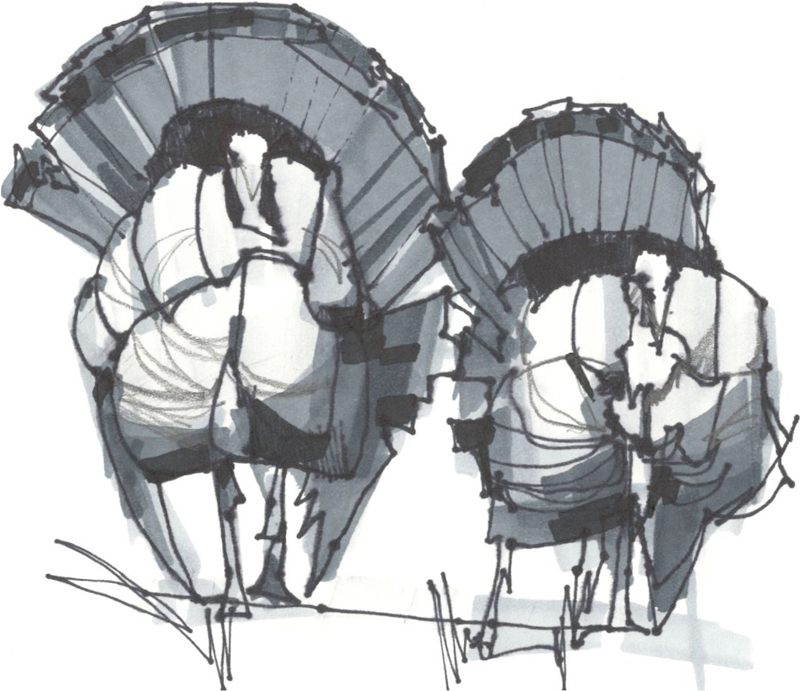 A couple of times it’s just been the odd turkey but with two Toms squaring off! And then I will go up my driveway coming home some days to find a flock at the top! I just love seeing them and love your colors Peter! They are fun to see and watch for sure. Thank you Michele!